Quilt Art Design: It's my B-Day!!! Today is a great day! Its my B-Day and its a public holiday here in RSA.... wonderful! Next time I'll go to the Kruger Park.... at least I know there are animals there. Happy birthday, Janeen. I trust that you will have an awesome day and many, many more. Thank you for the rooster pattern. I wish you the happiest of birthdays! Thanks for another lovely pattern. Wishing you a Happy Birthday. Have a GREAT day! Saddened that you trip didn't go as planned. And thanks for the rooster...darn cute. Thanks for the Rooster Pattern. Happy Birthday Janeen! Hope you have a wonderful day!! Thanks for the free pattern today and for all the wonderful patterns you design!! Whoop Whoop!! Hope your birthday was awesome! Happy Birthday Janeen! May you have a stunning year ahead! Wishing you all the best on your birthday. I hope it is a wonderful day! And thank you for the hipster pattern...love it! Happy Birthday and many many more happy ones. Happy Birthday Janeen! 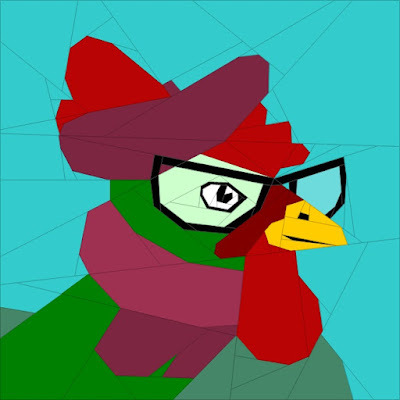 And thank you for the Hipster Rooster pattern - just looking at him makes me smile. Happy Birthday, Janeen! I hope you have a lovely day with the family. And thank you for the lovely rooster.I agree with Brenda. He makes me smile. Happy birthday! Thank you so much for the adorable patterns. Wishing you a very happy day today!! Hoping it's filled with fun, laughter, and fabric. Thanks for the free pattern. Happy Birthday! How lucky you are to be so close to be able to go on a safari. I would love to visit the Krueger National Park ... Djuma in particular to meet the Safari Live team. I watch their live safaris online all the time. Was so sad to find out that Karula went missing, never to be found again. Then several months later, her daughter Xongile went missing and hasn't been seen since. Watching baby elephants is my favorite as they are so darn cute and funny. Anyway, wishing you many, many, many more healthy and happy years ahead. Happy Birthday. I hope you had a really nice day.For the next 360 days I wish you all the best. Thanks so much for your patterns. I always love them. Happy Birthday. Hope next time with the animals will be better. Thank you for the fun pattern. Happy Happy Birthday!! And a local holiday to boot...lucky you! Happy, happy birthday, Janeen!! I sure hope you had a great day celebrating YOU!!! Sorry the animals weren't cooperating on your trip. Hopefully next time!! And what a fun, hip,rooster! Thanks for the pattern!!! Happy birthday! I'm a day late, but I believe in prolonging birthday celebrations as long as possible. At least a week. So keep celebrating! Happy birthday Janeen. In my quilting group, we have a policy that when it's your birthday you bring the cake. That way no one has the responsibility of remembering everyone else's special day. It works. Sort of like you giving everyone else a gift on your birthday. Thanks so much for the rooster. I hope to see a few completed roosters soon. He'd make a fabulous panel for a market tote bag. Happy birthday. Were you born on this holiday or is it one of the moveable ones? Anyway, you can think of it as a holiday for you. Thanks for the cute pattern. Sorry your trip was a dud. Happy belated birthday Janeen! Hope it was a great day! Happy birthday to our dearest FPP desinger!!! !